Sweet, juicy and easy to eat, grapes are classified by their use (eating or table grapes, wine-making and processing into juice, raisins and jelly) and color (white or black). White (green) grapes range in color from pale yellow-green to light green and black (red) grapes from light red to purplish-black. Table or eating grapes taste sweeter than tart, acidic wine-making grapes. California is the largest U.S. producer and many of their table grapes are in season now through January. So, when planning late summer and autumn meals, add vibrant grapes to appetizers, salads, sandwiches and desserts. Select bunches of plump grapes that are firmly attached to their stems. A white powdery bloom on the surface indicates freshness. Red grapes should have no tinge of green color. 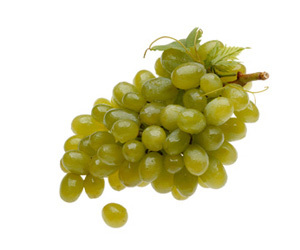 Green grapes with a yellowish hue are the ripest and sweetest. Avoid bruised, soft or moldy grapes. Remove and discard any spoiled or bruised grapes. Refrigerate, unwashed, in a sealable plastic bag for up to 1 week. Just before serving, thoroughly wash grapes under cold running water and pat dry with paper towels. Cut grapes into halves with a paring knife, or use kitchen scissors to snip small stemmed clusters from the larger bunch. Good source of vitamin C and low in fat and sodium. Arrange small clusters of grapes on a platter of assorted KRAFT Cheeses and crackers for a simple and delicious appetizer. Toss grape halves into creamy tuna and chicken salads made with KRAFT Mayo Real Mayonnaise or green salads tossed with your favorite KRAFT Dressing for a touch of color and sweet flavor. Freeze grapes for a cool and refreshing snack. Kids love them! Perk up pitas and wraps by adding grapes to sandwich fillings. Round out your favorite fruit salad with a handful of red and green grapes. Top off yogurt with some grapes for a tasty snack or breakfast.